More than a decade ago, quirky indie darling Greta Gerwig might have starred as the titular character of “Lady Bird”—not a biopic of Lyndon B. Johnson’s wife—but Gerwig actually makes it her solo writing-directing debut (she co-wrote and co-directed with Joe Swanberg on 2008’s “Nights and Weekends”). The project feels undeniably personal that one can just hear Gerwig’s voice through the performance of Saoirse Ronan, although not in a self-consciously quirky way that reminds one of the many times Woody Allen sometimes unsuccessfully cast another actor as his stand-in. Rather, Gerwig’s title character is an offbeat original and Ronan in the role only enhances the longing and adolescent emotions found in the already-terrific writing. Not only a coming-of-age film about living on the cusp of adulthood and trying to navigate pre-college life but also a love story between a mother and daughter, this is a lovely slice-of-life that feels freshly observed and deeply felt with a confident voice. In one word, “Lady Bird” is wonderful. 17-year-old Christine McPherson (Saoirse Ronan) is a bit of a rebel and a free-thinker. She has red-dye streaks in her brown hair and prefers to be called by her self-given name, “Lady Bird.” She’s starting her senior year at a Catholic high school and hopes to get out of Sacramento—the “Midwest of California”—and head to the East Coast, where the artists live. 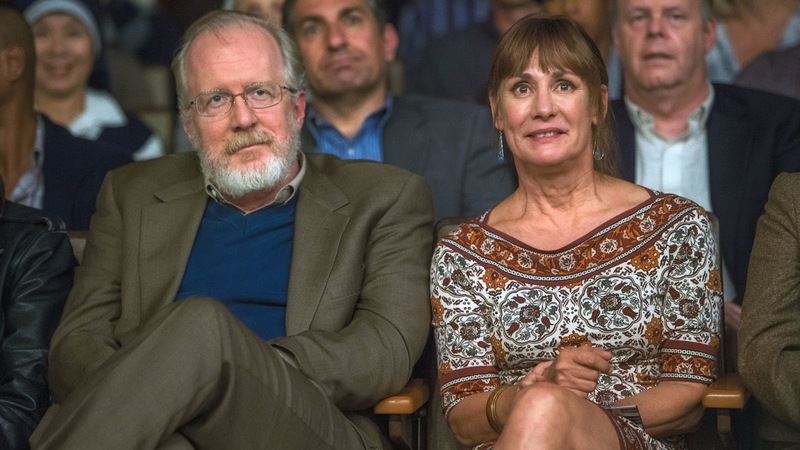 Her loving father, Larry (Tracy Letts), has recently lost his job and her family can barely afford to send her to a state school, while overly critical mother Marion (Laurie Metcalf) has a tumultuous relationship with her daughter. 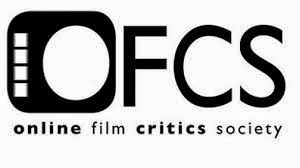 At school, Lady Bird and best friend Julie (Beanie Feldstein) sign up for a school play; she starts dating a nice, musically talented Irish-Catholic boy named Danny O’Neill (Lucas Hedges) and later hipster band leader Kyle (Timothée Chalamet), who fortuitously hangs out in the same circle as rich queen bee Jenna (Odeya Rush). 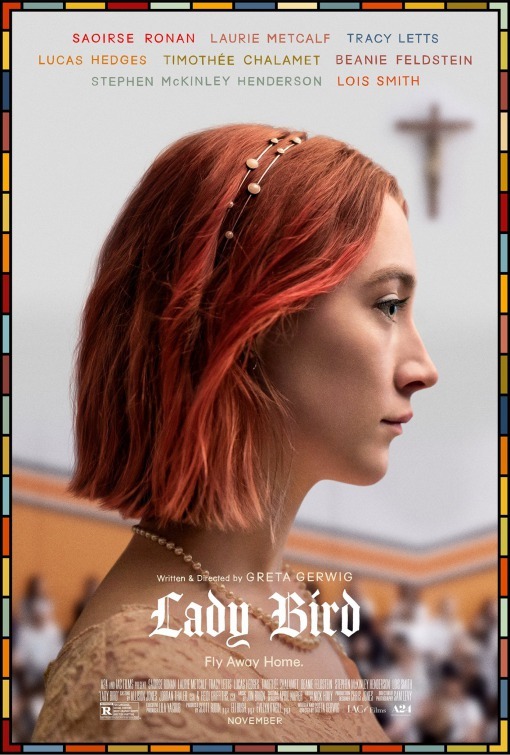 Throughout the course of the school year, Lady Bird tries out different versions of herself as she tries finding her way in the world. 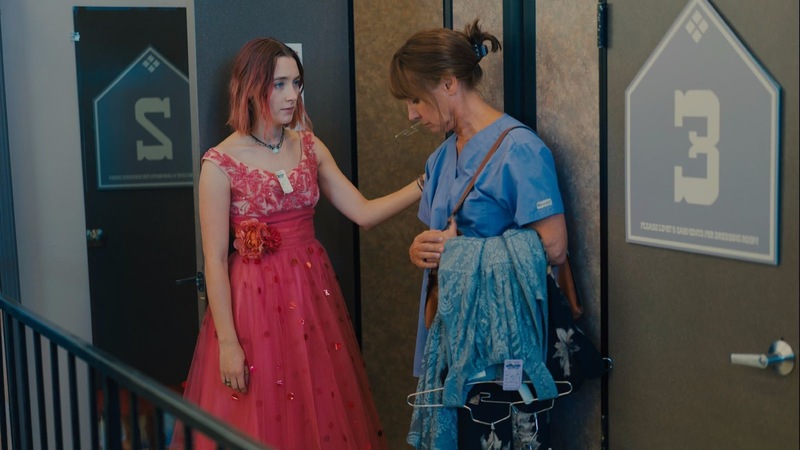 From the first telling moments of the film that are by turns sweet, intimate and tense, Lady Bird and her mother have a relationship that’s grounded in love, but their strong personalities clash when it comes to talking about Lady Bird’s work ethic and future after graduation. They’re prickly and then instantly bond, whether it’s over a powerful book on tape or a pretty thrift-shop dress. 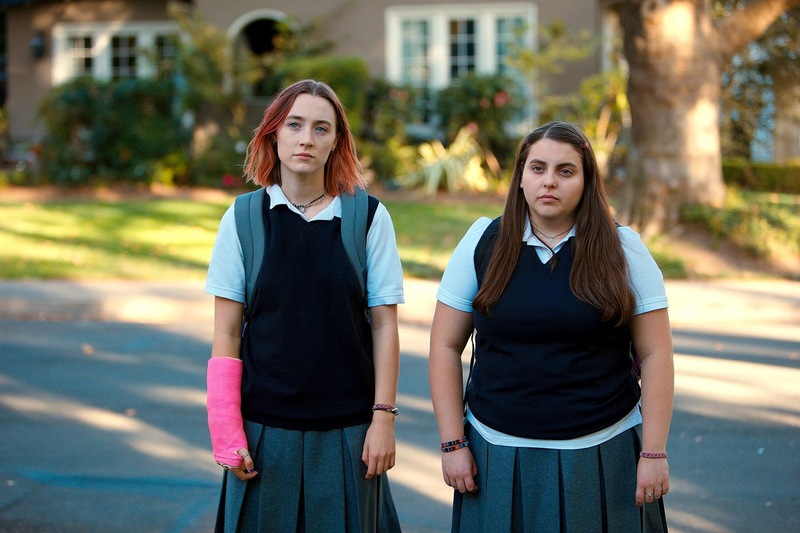 Lady Bird is an ordinary but compelling teenage girl, which in a way makes her extraordinary. Like any teenage girl, or teenager for that matter, she thinks the world revolves around her, blind to everyone else experiencing their own problems, and she doesn’t always do the right thing, and yet Lady Bird has her redemptive moments that come on their own time and avoid coming off false or contrived. Saoirse Ronan’s open, appealing, identifiable and complicated performance would be enough, but the film is generous to all of its characters, giving them all room to shine and finding humanity in all of them without seeming like a bunch of eccentrics on the sidelines. So much happens in “Lady Bird,” but everything feels satisfyingly developed in a semi-autobiographical script that is well-stuffed, albeit tight, without coming across episodic or unfocused. It feels as messy as real life and covers a full emotional spectrum. Proving herself an assured storyteller and filmmaker, Greta Gerwig beautifully builds her scenes into one another with speedy, efficient and effective use of editing; for instance, the audio of a countdown starts three scenes early, shifting from Lady Bird printing out her financial aid and then rushing into the post office to a scene of her ringing in the New Year. Setting the film in a post-9/11 reality from 2002 to 2003, Gerwig also sprinkles in pitch-perfect musical choices for flavor of the aughts, including Alanis Morissette’s “Hand in My Pocket” and Dave Matthews Band’s “Crash Into Me,” which is used in a pivotal moment on her way to the prom. Sharply funny, insightful and poignant, “Lady Bird” is close to perfect, the kind of film the viewer doesn’t want to end with characters one doesn’t want to see go. On second thought, it is perfect.